Guadalajara Cathedral as seen from the Plaza de la Liberación. Walk-through nativity scene (with the obligatory elephant) is in the foreground. December 17 – 20, 2018. We had not intended to go to Guadalajara. 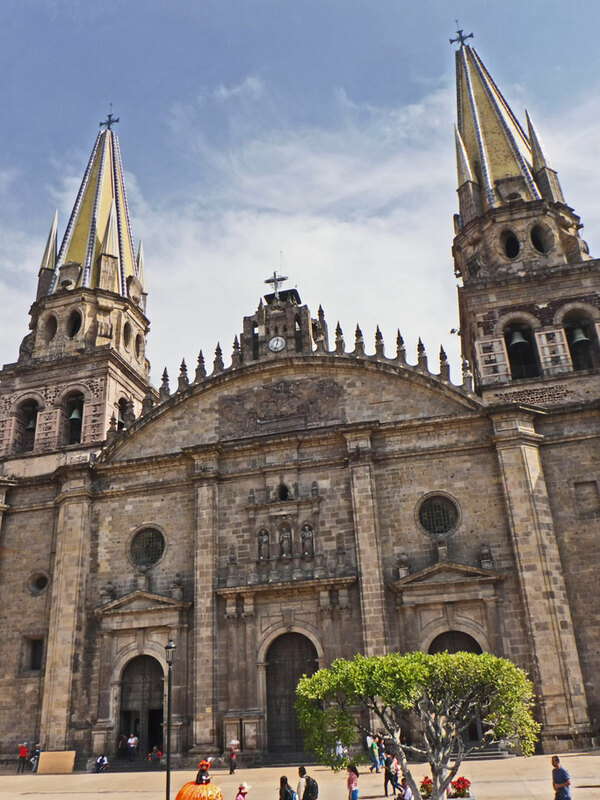 Guadalajara is the second largest city in Mexico, right after Mexico City, and in general we try to avoid big cities, because there is no where to camp and driving a whale like Ballena Blanca is scary enough in smaller towns with less traffic and fewer roads to navigate. But then our computer broke, and because I didn’t want to lose all my programs, files, and photos, we had little option but to get it fixed. And the closest big city looked like the best option to do that. Finding a place to get the computer fixed was a bit stressful. 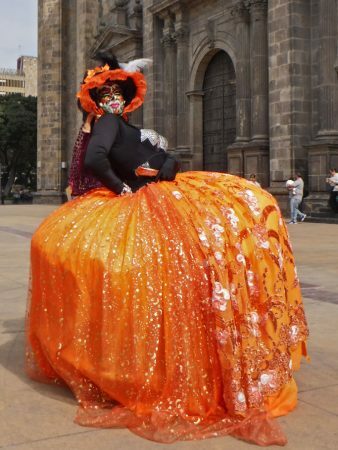 I had searched online and had asked for suggestions from one of my Facebook Mexico groups. When we finally located (after much confusion on how to get off the highway and then much circling around looking for an actual store) my first choice on the outskirts of the city, it appeared to be a discount mobile phone store – maybe they fixed computers and maybe they would have done a good job but I didn’t feel good about leaving the computer with a shop whose primary focus probably was selling cheap cellular communication. My second option was a repair shop in El Centro (downtown). Their website featured pictures of employees and their families (always endearing) and no mobile phones. This time we circled around narrow congested one way streets, missing our turn to the street the shop was located on on the first pass only to find it blocked off on our second pass. Since there was no place to park and we couldn’t get a visual confirmation that this place wasn’t really just selling the latest android knockoff we headed out of downtown. After driving through many 5, 6, 7 way roundabouts we found our third option, iExperts. We couldn’t fit into the tiny parking spaces in front of the shop but after a couple of passes I determined that they didn’t seem to be selling mobile phones or anything else. We found a parking spot on a side street and walked up to the store with our poor broken Mac. I had practiced what to say in Spanish, “La pantalla no enciende” – “The screen doesn’t come on,” – and although I fumbled it out, I didn’t need to. Our guy, Oscar, sitting at his desk in this tiny but cosy office, spoke English. He shined a flashlight at the screen and peered into it, then plugged it to an external monitor. He said he thought it might need a new screen ($18,000 pesos -$900 US – he warned us) but wanted to do some more tests before he was sure. Then he’d need to place an order for the replacement part. This was Monday and the shop would be closing after Saturday for two weeks for the Christmas holidays, but he assured me that he could fix it by the end of the week. We left the computer with him and headed back out into the city, not really sure where we were going to spend the night. We found a park, ate lunch, took a stroll and assessed our options. There was a gated parking garage about a mile and a half from iExperts, back towards El Centro. It had good reviews on iOverlander, and only cost $6.50 US a day. We decide to check it out. Our first experience camping in an urban gated parking garage was a success. As advertised, the owner was super nice and helpful, the place was secure, and bonus – they had wifi. 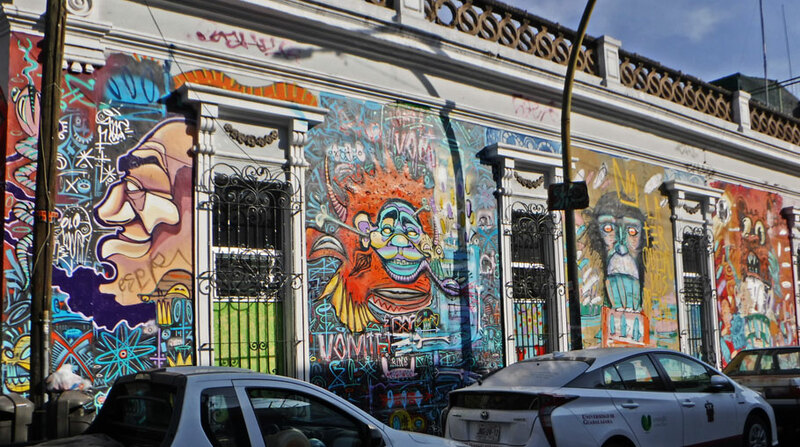 We were in walking distance to El Centro, where we discovered the muralist Orozco and the beauty of this amazing city. We stayed there four nights. After this very small English lesson, we handed Oscar our credit card and left the shop $28,000 pesos (almost $1400 US for the Logic Board!) poorer, and were on our way navigating our giant white whale through crazy busy streets filled with holiday shoppers out of the big city and away from our unexpectedly awesome detour with our oh-so very expensive computer. 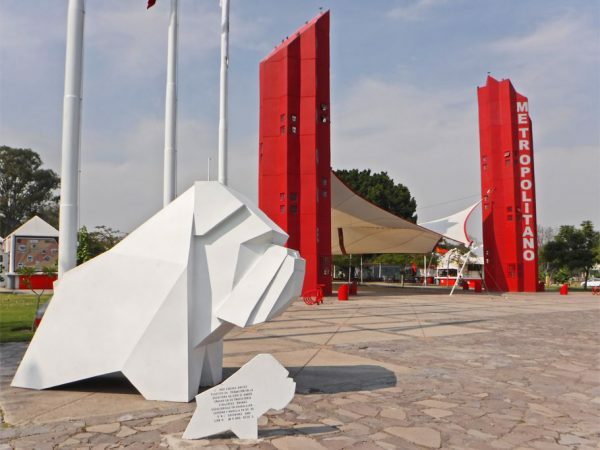 Entrance to Metropolitano Park in Guadalajara. The park has miles of walking and jogging trails, and features many types of plant life and sulptures. El Arbol Que Camino, or the tree that walked. This tree was blown over by a storm. 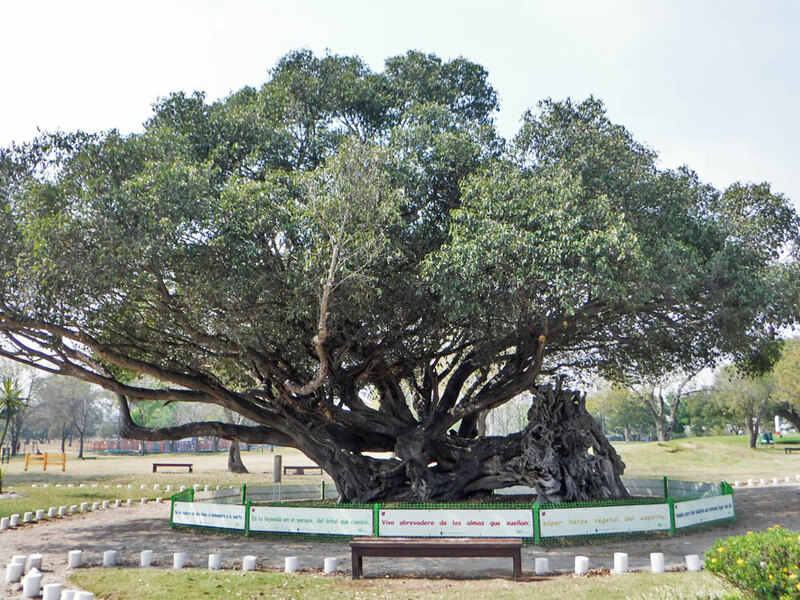 It rerooted after its fall. 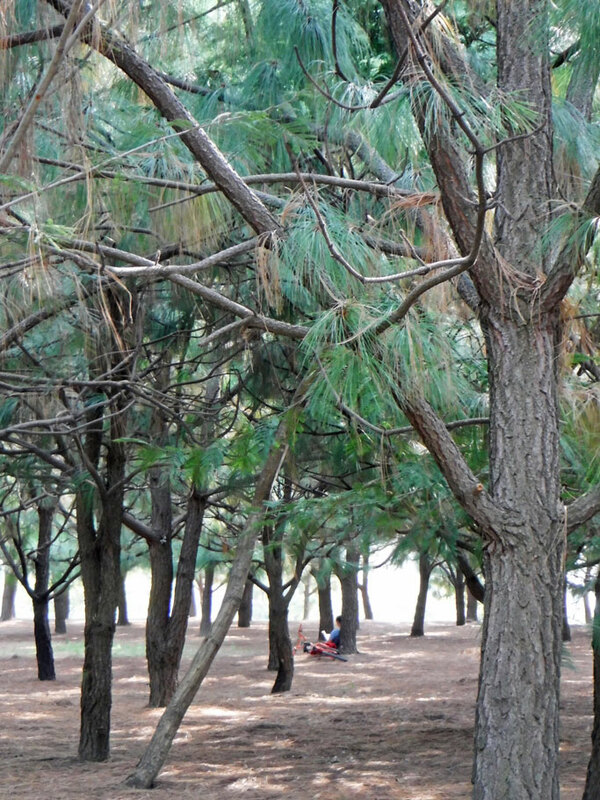 Pine forest section of Metropolitano Park. 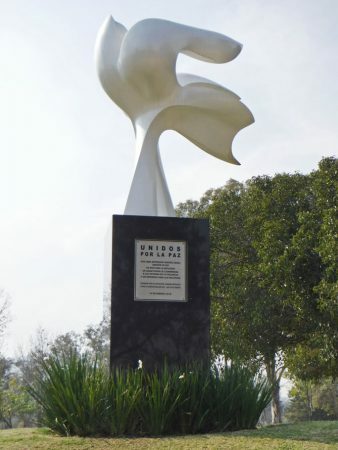 “United for Peace” Dove statue in Metropolitano Park. The Catedral de la Asunción de Santa Maria was completed in 1618. An earthquake in the early 1800s brought down the dome and square towers. Twenty years later another earthquake toppled the replacements. These replacements have withstood six temblors. Have your pic taken with one of the costumed characters in the plaza. In the Plaza de Armas this bandstand was imported from France in 1909. 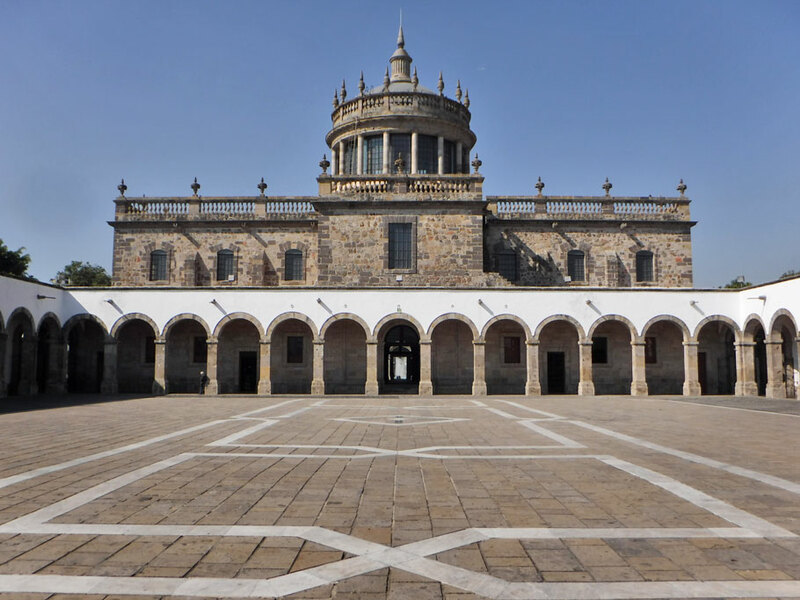 The baroque Governor’s Palace was completed in 1790. 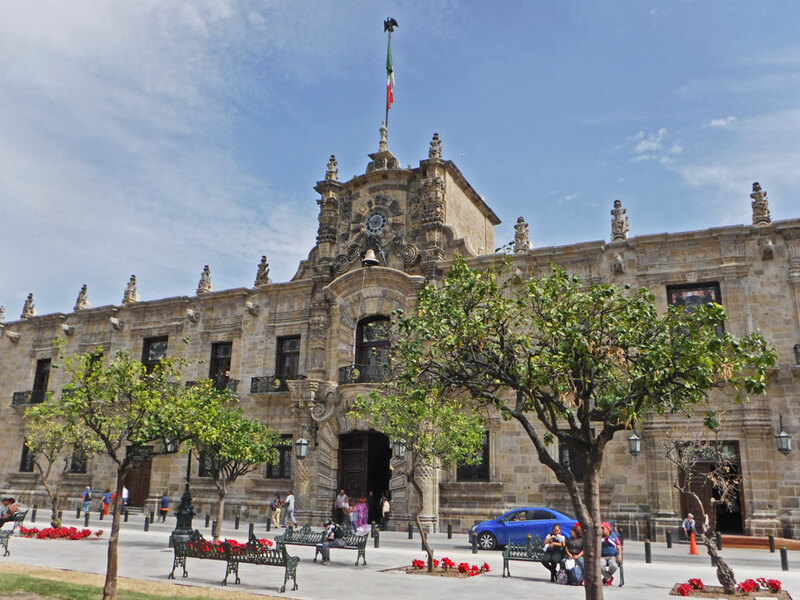 Mexican hero Miguel Hidalgo lived here during the Mexican War of Independence. Close up of Migual Hidalgo in a stairway of the Governor’s Palace. From this palace Hidalgo issued a proclamation ending slavery. 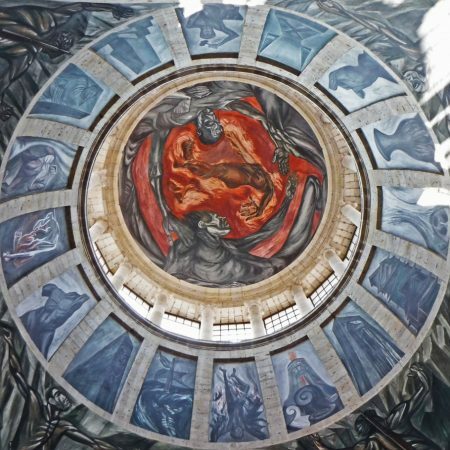 This mural was painted by Jose Clemente Orozco. Another Orozco mural of Hidalgo is painted on ceiling of the senate chamber. Greg sits on a bench in the Sala de los Magos (or living room of the wizards). 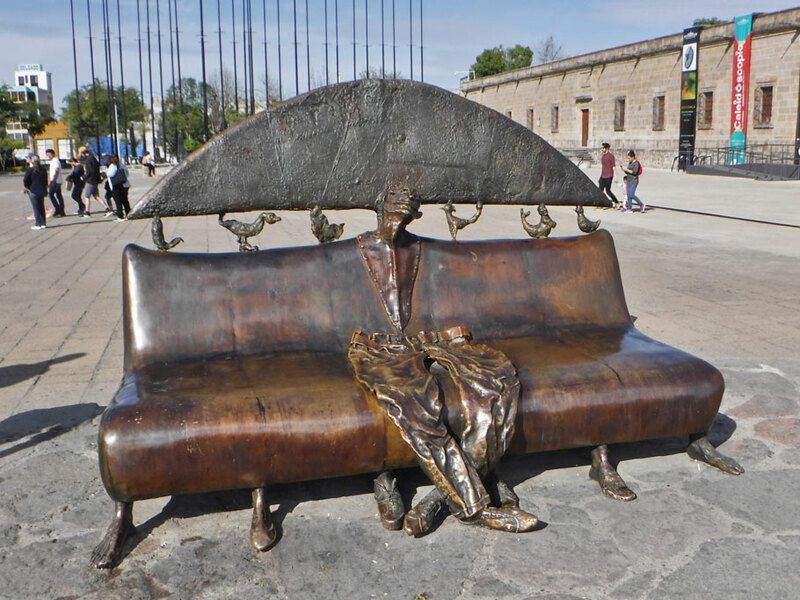 Many benches here were designed by Alejandro Colunga. They are all wizards morphing from one shape to another. Another Colunga bench in the Sala de los Magos. 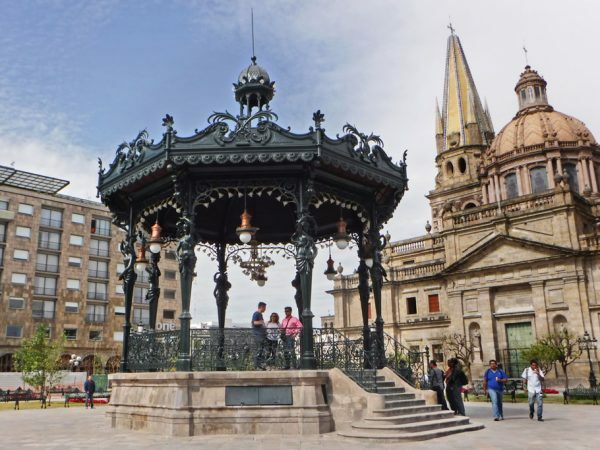 Guadalajara is where mariachi music was born. This small square is where it is celebrated each evening. It’s dark under the porch ahead of us, so you can’t see the families eating lunch, or hear the trumpets blaring. 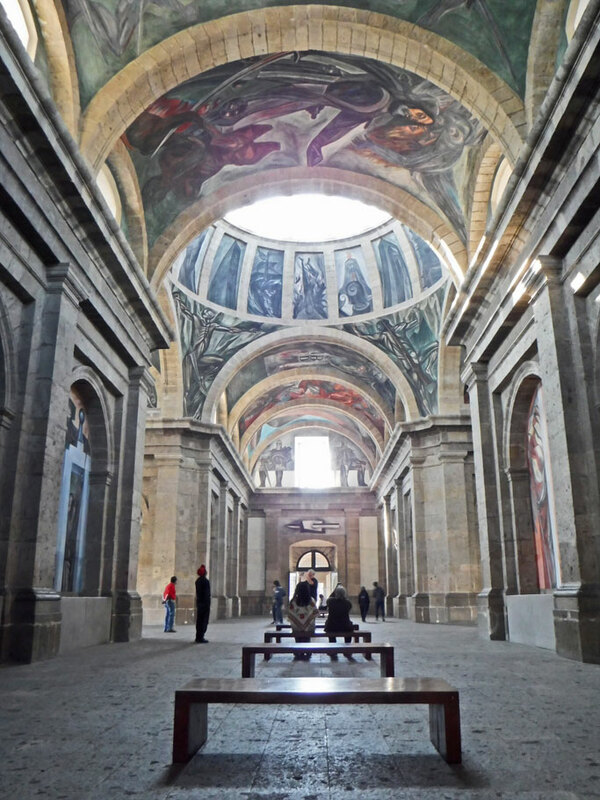 One of Guadalajara’s prized gems is the Instituto Cultural Cabañas. Built in the late 1700s as a hospital, it has also served as an orphanage and a work house. In the 1930s Orozco painted 57 murals in this space. The institute is now an UNESCO World Heritage Site. 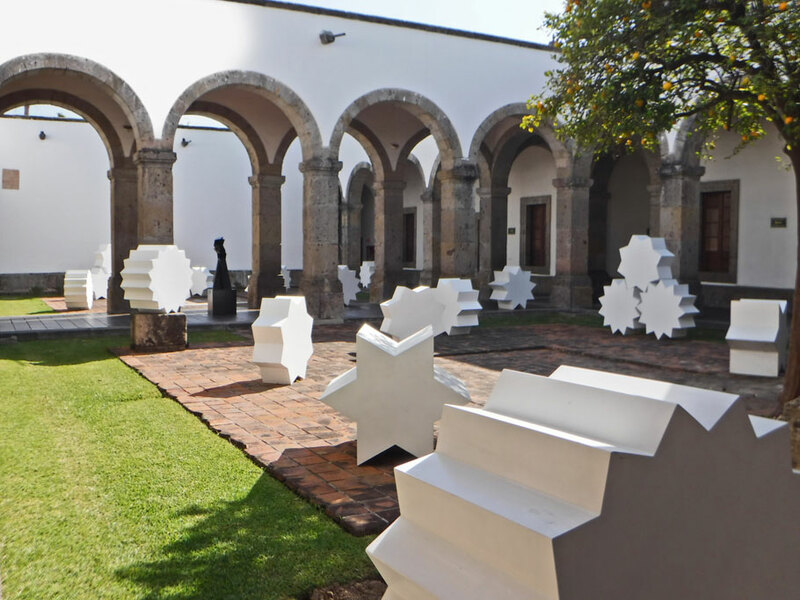 Courtyard of Instituto Cultural Cabañas. A very kind english-speaking guide showed us around the facility. Being the only gringos in sight, we get approached by people who know English. 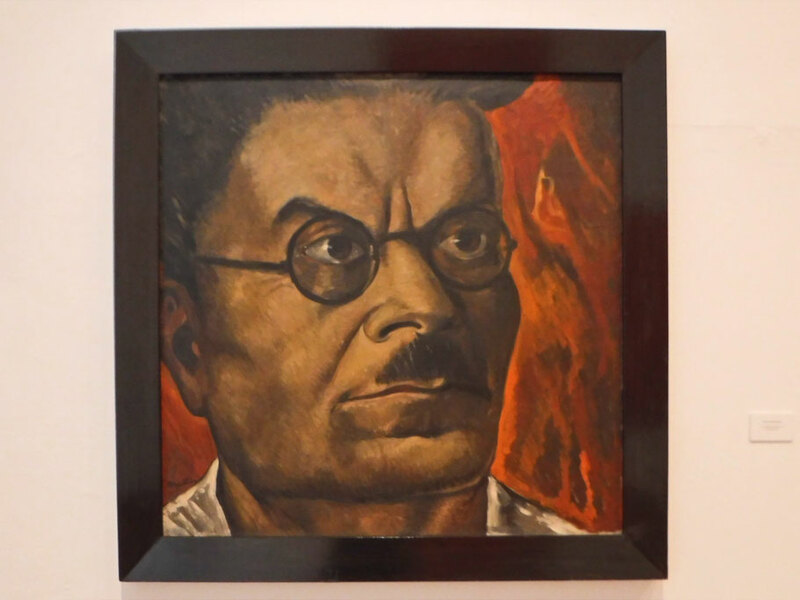 Portrait of Jose Clemente Orozco. 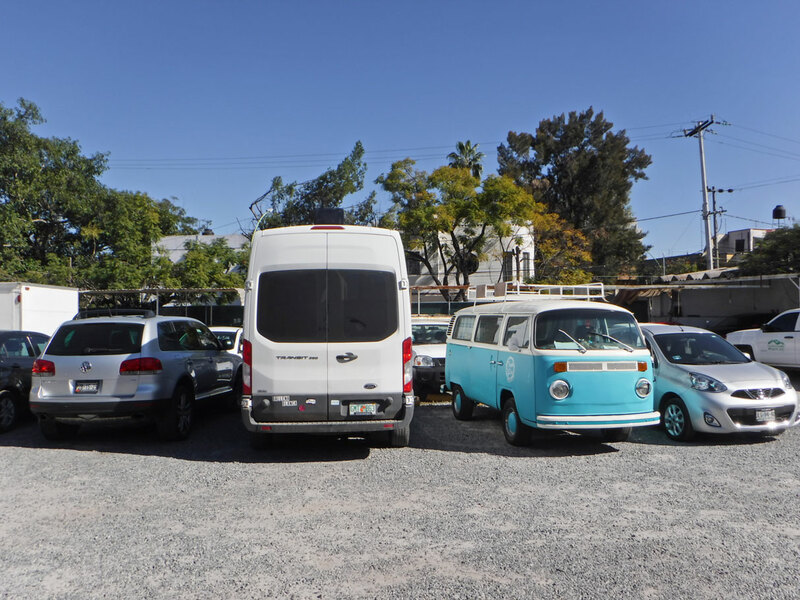 Our home – parking/camping spot for 4 nights while we were in Guadalajara. 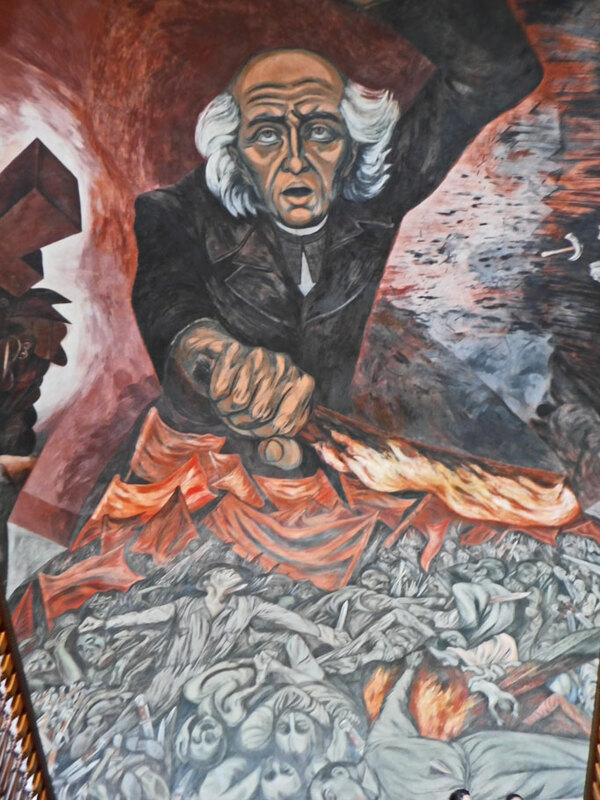 This entry was posted in Jalisco, Mexico, Travel On The Dirt and tagged Guadalajara, Instituto Cultural Cabañas, Jalisco, Jose Clemente Orozco, Mexico, Orozco, Sala de los Magos. Bookmark the permalink. Thank you for following along Brenda! Lucky for us they are just small obstacles. Hopefully we won’t get to see how we confront big obstacles. What a beautiful city, and unexpected trip. The artwork is amazing and obstacles are, unfortunately, such a big part of long-term travel. It’s good to be flexible. But… so expensive! When you mentioned the price of the screen, I already choked. And then to read what you actually ended up paying… I had no idea Macs were this expensive. I think my Toshiba laptop cost $400 a few years ago. But, we always find good deals. And it’s no Mac! 🙂 Of course, all the stuff on the computer, like photos and files are priceless. The cost of Macs is quickly making me fall out of love with them. This summer I really need to research an alternative. The biggest problem I have leaving Apple is that I will lose the very expensive Adobe software I bought for it. I love love Photoshop and have not found any image editing software to compare. But all of this did bring us to Guadalajara. We might go back for a Guillermo del Toro exhibit that starts in February – especially now that we know a bit about the city and have a safe place to park. Love it. The benches are fantastic! We have the same pics. Sorry your computer fix was so $$. Wow! The benches are great! 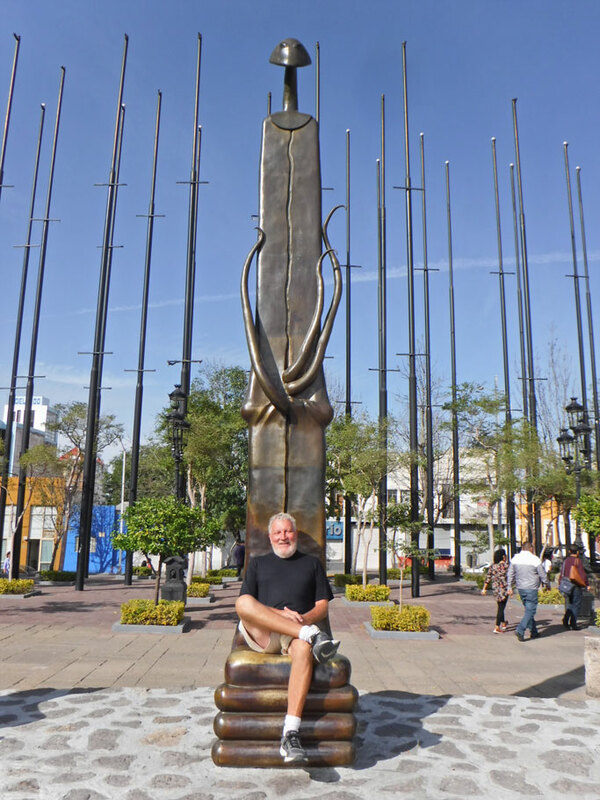 Guadalajara really is a lovely city. Great pics. Glad you had better neighbors this time. And no late night visits from el policia. Thanks Robert! So good to hear from you. Yes, besides the computer issue our visit to Guadalajara was a very positive experience. Hi Duwan and Greg, Again we are so impressed with your ability to navigate a BIG problem in a BIG Mexican city. I guess I am in awe as my biggest nightmare is driving in a huge city with one-way streets and getting lost (actual event: Boston with grandson in car). But the bonus! 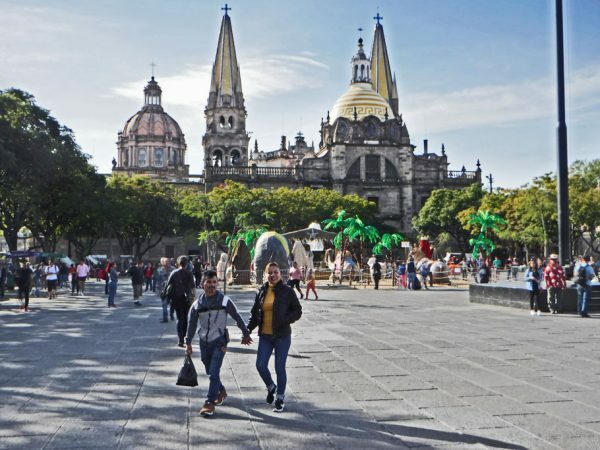 You got to see and really appreciate the lovely city of Guadalajara. Nothing like taking a bad situation and turning it into a fun adventure. Love your posts. We are well and hope you are too. I am glad Greg does all the driving. It is quite frightening driving almost anywhere in Mexico. 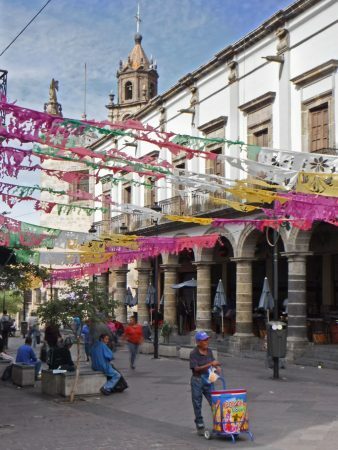 Mexican drivers sort of make up the rules as they go. I am so surprised we don’t see more accidents. The best we can do is turn the bad into fun adventures. Even if they aren’t at all fun at the time they make good stories later. So glad you and Ed are doing well. We always love hearing from you!